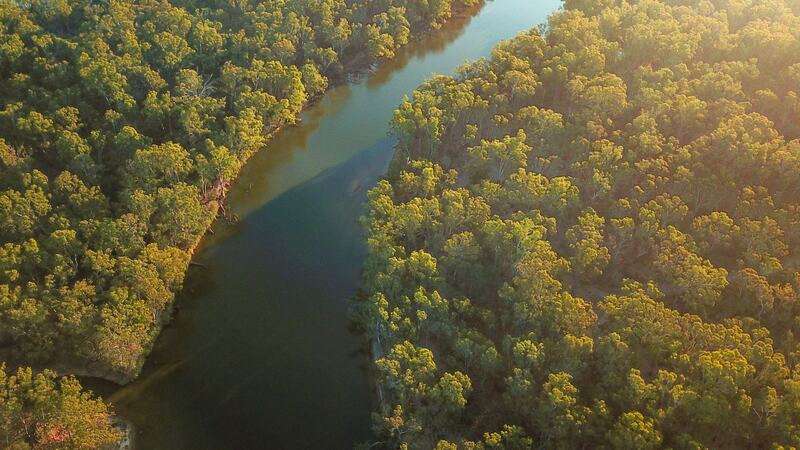 Creating the border between Victoria and New South Wales is the mighty Murray River. Measuring as Australia’s biggest river the Murray River home to countless country towns, an abundance of native wildlife and is a wonderful place to relax, unwind and take a step back from big city life. 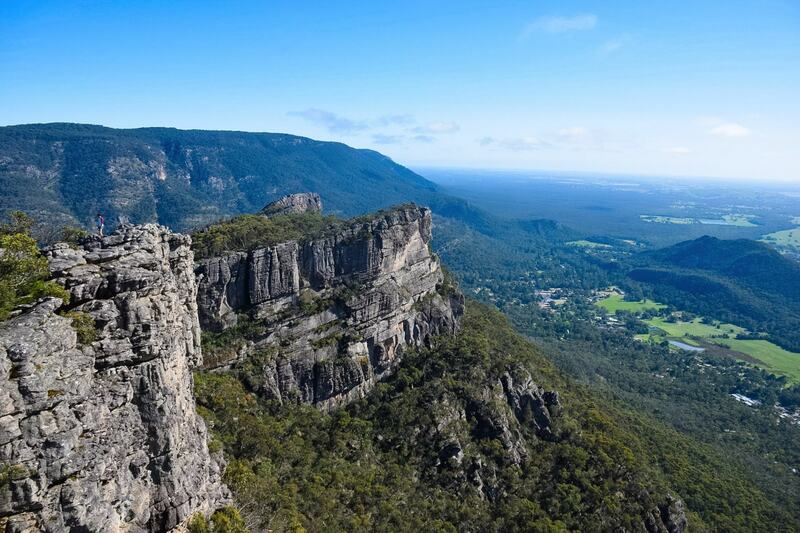 It’s one of Thom’s favourite places in Australia so far, somewhere he grew up coming with his family since he was a kid, so it has a soft spot in our hearts. The remote location also means limited reception and internet, giving you the perfect excuse to unplug, switch off, disconnect from technology and take some time to relax and reconnect with nature. The Murray River creates the boarder between Victoria and New South Wales, running for 1,880km – almost the whole length of the VIC/NSW border. 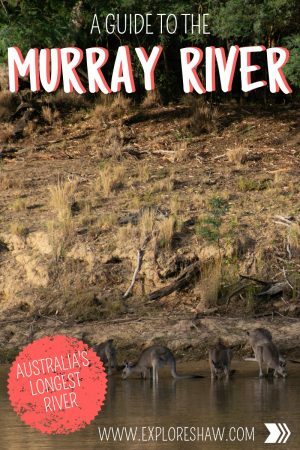 Depending on which part of the Murray you’re visiting, it can be anywhere from 2.5 to about 6 hours away from Melbourne, and is a nice easy spot for a quick weekend getaway in nature. The Murray River is absolutely huge, crossing over three states and running 2,530km from Mount Kosciuszko all the way to the Southern Ocean near Goolwa in South Australia. Because of this, the best time to visit really depends on which part of the river you are visiting. For any towns from Echuca to about Albury Wodonga the best time to visit is during the summer time and the shoulder seasons when the weather is nice and hot and you can really enjoy swimming and all the water activities you can take part in on the Murray. 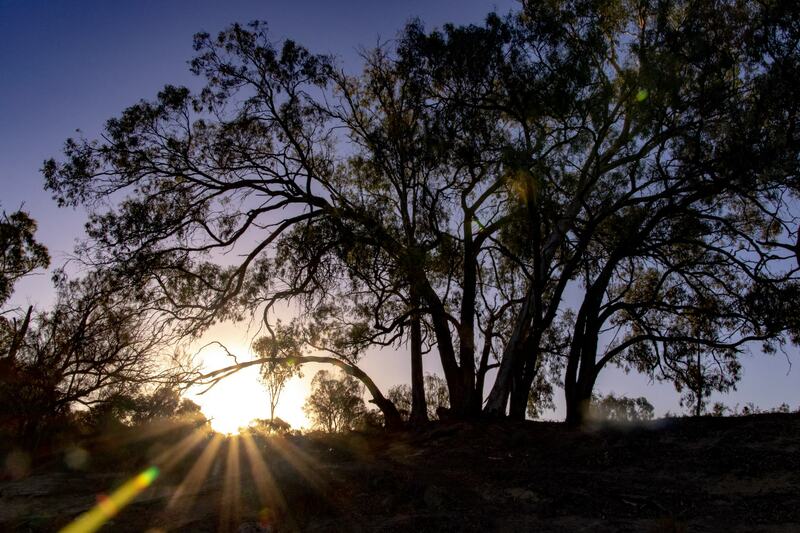 For the more rural locations from Swan Hill over to Renmark, the summer is almost unbearable, with temperatures regularly hitting over 40 degrees. Visit either during spring or autumn for the best weather, when the high temps have calmed down a little bit. No matter where you’re planning to visit along the Murray River, school holidays and Victorian long weekends are always absolutely crazy, wither thousands of people flocking to the Murray to take advantage of the warmer weather. 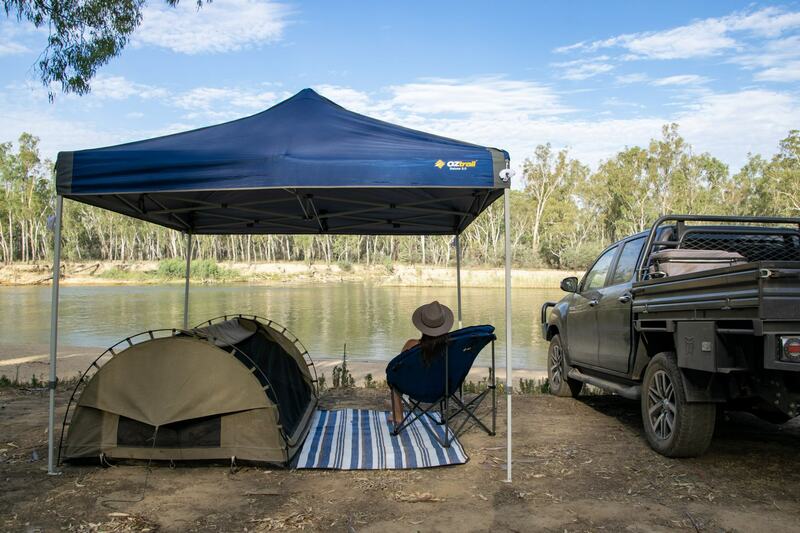 If you’re planning on travelling during these peak periods it’s a good idea to go up a few days earlier to beat the crowds and secure yourself a good Murray River camping spot before the weekend begins. One weekend after a long weekend and you can find you have whole sections of the river to yourself and it’s much calmer and more pleasant! 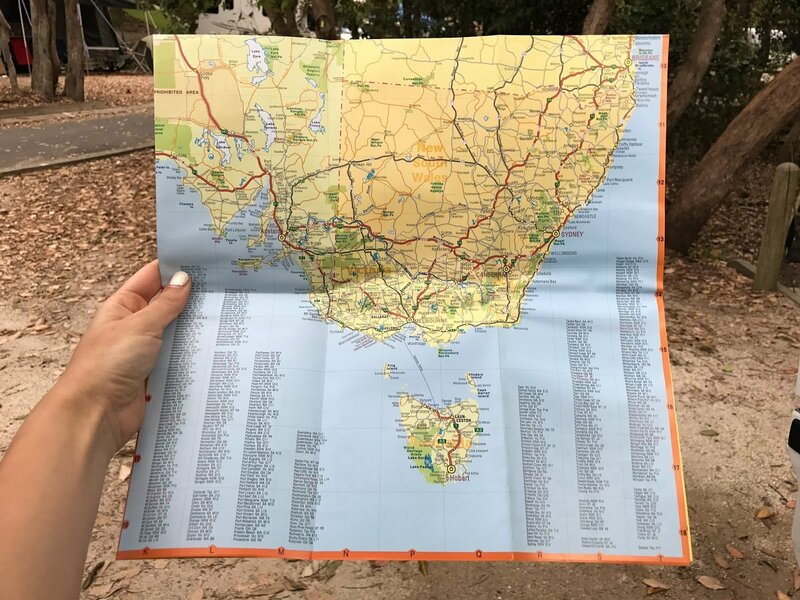 For this post, we’re going to start at the end of the Murray River, at the Murray Mouth Lookout in South Australia and follow it back up through SA, across to Victoria and all the way to almost the end at Albury Wodonga. This is the place where the Murray River finally comes to an end and runs into the Southern Ocean in South Australia. It’s such a unique place to visit, with different conditions each and every day. In fact, the Murray Mouth location actually moves around, as the sand dunes move over time, so it has not always been in exactly the same place. About 10km east of Goolwa, the mouth of the Murray is surrounded by sand dunes, islands and national parks and offers some beautiful landscapes and views of the whole area. 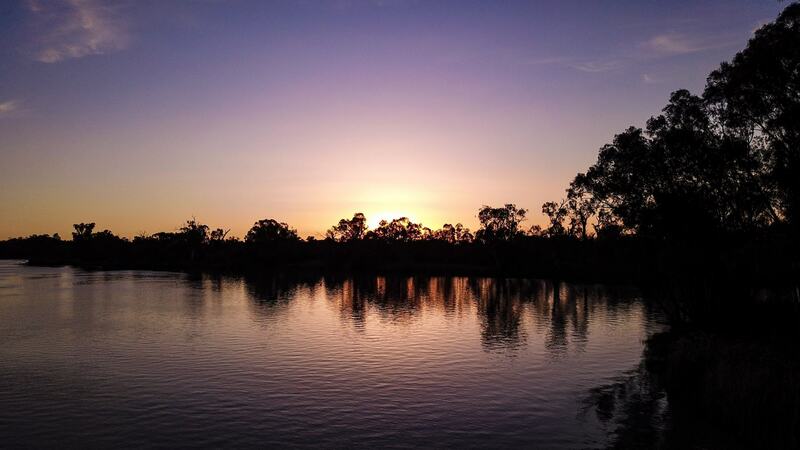 It’s a great place to visit, especially if you’re as obsessed with the Murray River as Thom is! Book a Murray Mouth cruise for the best views of where the river meets the ocean. Along the Murray River in South Australia, there are lots of different ferries that can cross you from one side of the river to the other, but the original river crossing is between Murray Bridge and Wellington. Built in 1839, the Wellington Punt was the first crossing taking people and their vehicles from one side of the Murray to the other. It’s a short trip, only about 10 minutes and can generally fit around 15 cars on board (depending on car size, trailers, caravans, etc) and is a very unique way to cross the Murray. Everyone at the Murray Bridge/Wellington ferry are so lovely, and the ferry operates for free each and every day, cutting quite a bit of time off your trip if you’re heading down to the SA coastline. One of the main places to access the Murray River in South Australia, Renmark is a great location for a weekend on the water. It has a big main town with everything you could need, including a great laundromat if you’ve been camping for a few weeks and need some fresh clothes! Grab a hard lemonade at the Woolshed Brewery, located in the 100 year old woolshed of Wilkadene Station, the Woolshed Brewery offers local craft beers and their infamous hard lemonade drink. Overlooking the river and with a beautiful outdoor beer garden, it’s a great place to embrace the heat and enjoy a taste of rural South Australia. Camp on the river at Plushs Bend Free Camp, which is easy to access with sealed roads and even has real toilets on site for a little bit of camping luxury. Canoe around Riverland with kayaks available for rent and lots of self-guided trails in the area. These trails will that you through the wetlands from a riverfront property, through looping creeks with lots of beautiful wildlife. Check out Headings Cliffs Lookout on Headings Road for beautiful views over the Murray River and the amazing Golden Limestone Cliffs. Visit the Almond Co Almond Hut and pick up a sample of some of the local grown almonds that are roasted in all kinds of flavours. From Renmark, we cross the boarder and jump the half hour time zone forwards to end up in Mildura, the biggest Victorian town along the Murray River. 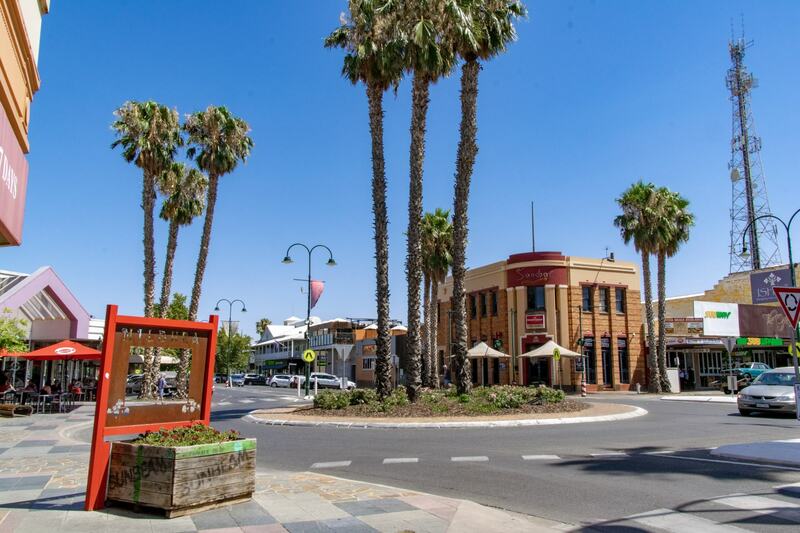 There is so much to see and do around Mildura, with everything from rivers and wetlands to pink lakes and desert plains just outside the town walls. Whether you’re visiting for a weekend or a whole week, there’s more than enough to keep you entertained for days on end. Mildura is also the iconic birth place of Australia’s (and my) favourite Mildura Juice, if you’ve never tried it before make sure you try some while you’re here! Hit up the local fishing spots and see if you can catch a meter long Murray Cod (that’s Thom’s dream). 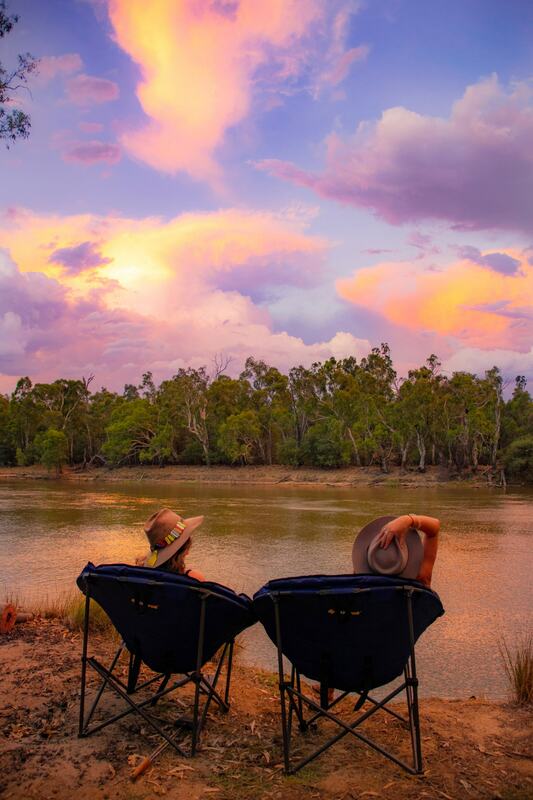 If you’re not sure where to start, check out Bruce’s Bend, Johnson’s Bend, Merbein Common, Kings Billabong and Butler’s Creek which all also offer great free camping spots. Lots of National Parks lie just outside Mildura, offering an abundance of wildlife, pink lakes, sand dunes and 4X4 tracks to explore. 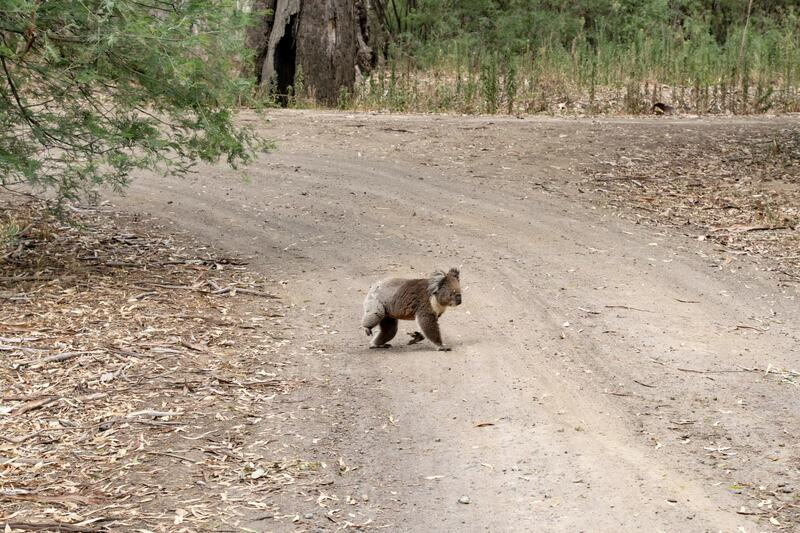 The main park in the area is Murray Sunset National Park offering you a taste of the outback just an hour drive from Mildura. There is also Hattah-Kulkyne National Park only 45 minutes out of town, where you can find all kinds of lakes, sand dunes and native wildlife. Also, heading up into New South Wales is Mungo National Park, which has such a surreal landscape it kinda looks like you’re visiting the Moon! It’s incredibly beautiful with sweeping views over the outback and insane rock formations looming out of the horizon, it’s a great place to visit at sunrise and sunset. 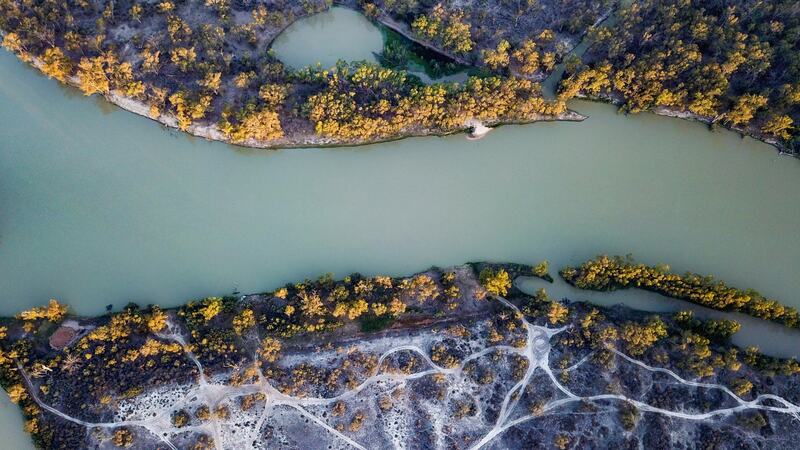 A little bit overlooked by it’s big sister Mildura around the corner, Wentworth can be found where the iconic Murray River meets the Darling River. While here make sure you check out the Wentworth Makers who are infamous for their beautiful works of art and local crafts around the area, which you can find in local galleries and markets. Just a couple of hours along the river from Mildura you can find Swan Hill, another river town with more sunshine than you can imagine and a rich pioneer history of early days along the Murray. Grab a multi-attraction ticket to see all the best that Swan Hill has to offer. First head to the Pioneer Settlement where you can step back in time and experience the best that pioneer history has to offer, complete with old fashioned cars, horse and carts and historical old stores. 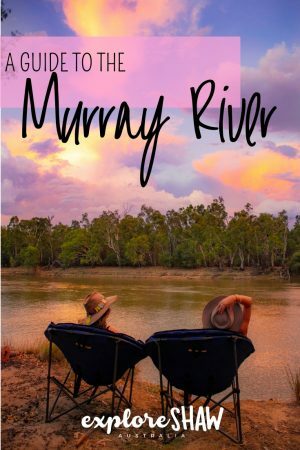 From the settlement, jump on a luxury river cruise on the PS Pyap that will take you upstream past the historical Murray Downs Homestead. End the night with the spectacular Heartbeat of the Murray show, a dramatic laser and sound show that tells an epic story of the Murray River against the back drop of a 9 metre water screen. The show starts just after the sun has set (around 9:15pm each night) and everything comes to life under the bright stars of the night. 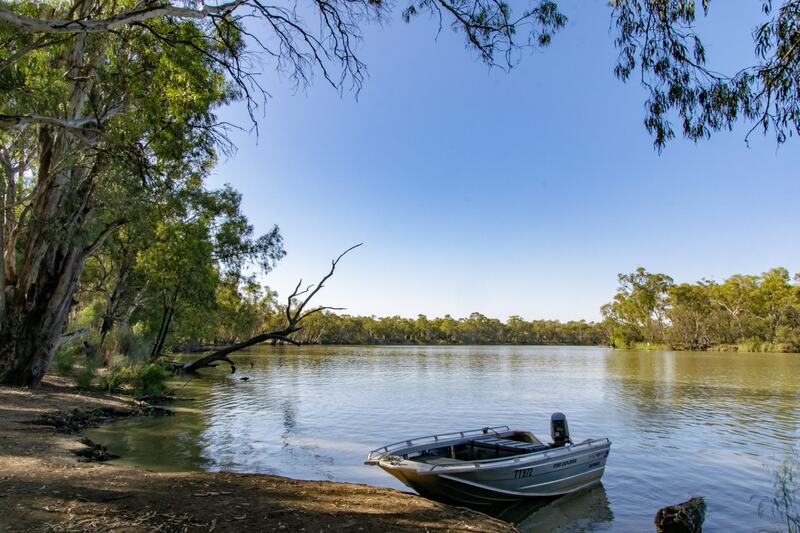 Only about 20 minutes out of Swan Hill, Lake Boga is a hot spot for water sports and activities including boating, fishing, skiing, sailing and swimming. It’s a great place to camp if you want the ultimate water experience, and is also rich in history with the Flying Boat Museum right in the area. One of the biggest and most popular towns along the Murray River, Echuca is a beautiful piece of the river, with a town rich in great restaurants, historical features, music festivals and of course the iconic river feels. Home to the iconic Port of Echuca and with sunny weather all year round, Echuca is a hot spot for families and holiday goers, and can be super busy during school holidays and public holiday long weekends throughout the year. If you’re visiting at these times, expect larger crowds and book accommodation in advance to avoid missing out. 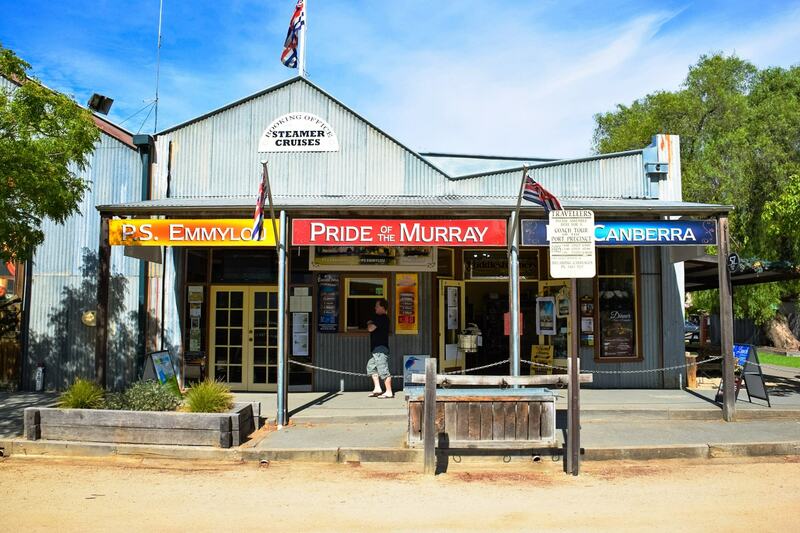 Take a step back in time at the Port of Echuca which is a pioneer town that has been preserved since the 1860s. 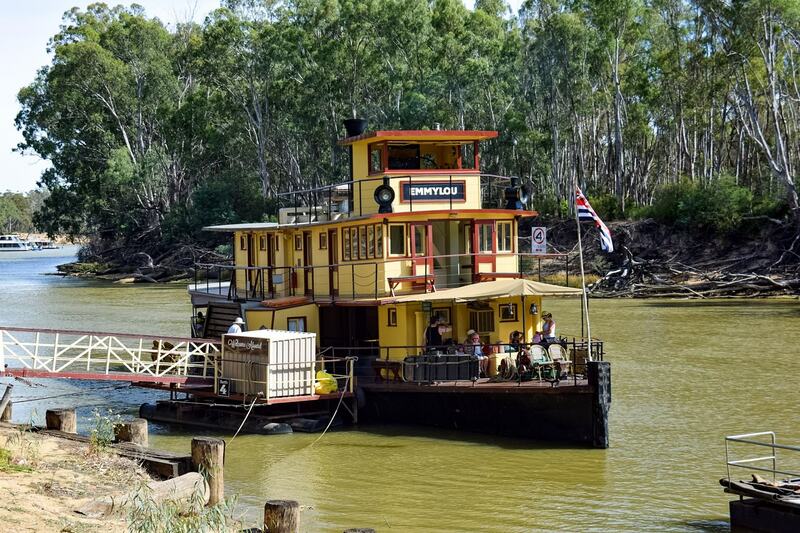 Here you can learn all about the history of Australia’s inland river systems, the paddlesteamers and how they connected the community of Echuca with the rest of the country. During the school holidays you can take an authentic horse and cart ride down the Murray Esplanade with Billabong Carriages for an even more unique step back in time. Cruise down the mighty Murray River on the iconic PS Emmylou for some delicious scones with jam onboard this relaxing cruise. There are actually a few paddlesteamers that you can take a cruise on, including the Pride of the Murray and PS Canberra. With a thriving local produce industry take yourself on a tasting tour around Echuca and the surrounding regions. There are lots of local wineries to check out, as well as the local Echuca Farmers Market which is a great place to start with all kinds of fresh produce from the area. Take a winery tour with For The Love of Grape who lets you choose your own wineries and local specialty food producers and then create a personalized tour for you to check them all out. A great way to explore, you don’t have to worry about directions or organizing anything and can just sit back and enjoy the experience. Ulupna Island might just be my favourite place to camp along the Murray. 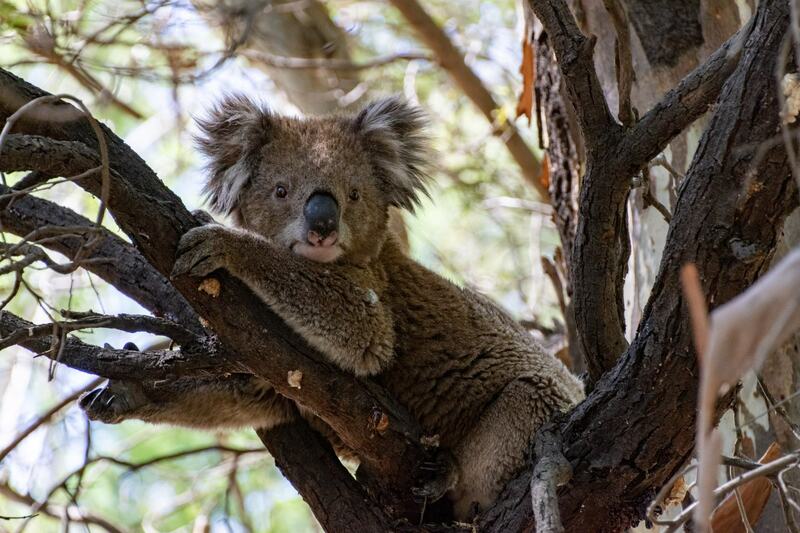 We stopped there unexpectedly overnight in January and were amazed to find more than 35 wild koalas and heaps of kangaroos happily chilling in the campsites around the area and coming down to the river to have a drink. 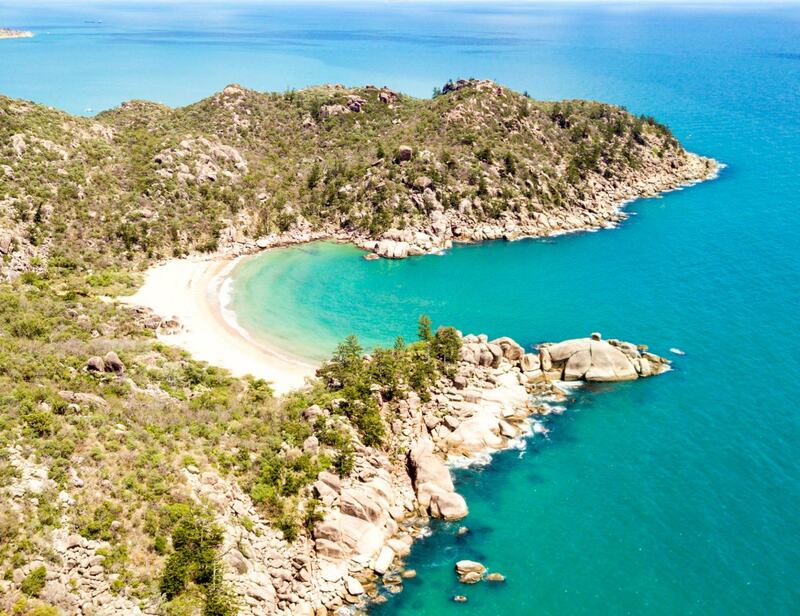 It’s a great place to camp along the river, with sandy beaches, easy boat access, grassy camp sites and even drop toilets available in the area. 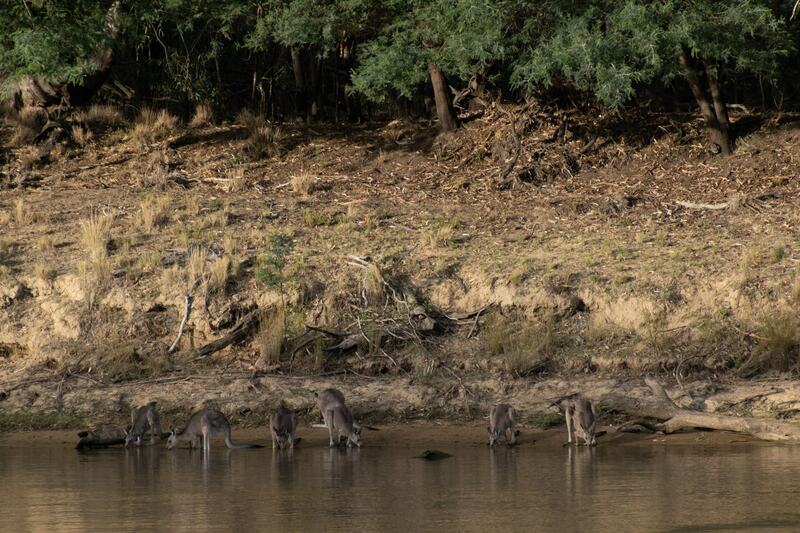 Away from the main towns of the Murray River, it’s also a much quieter place to camp and the perfect nature experience. For a super unique experience in what feels like the middle of nowhere, take a walk around the epic Cactus Country. 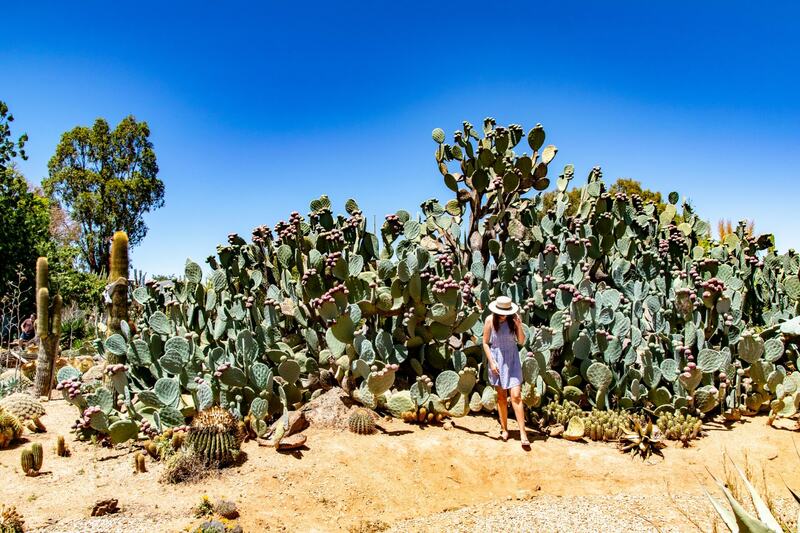 This amazing garden is home to more than 4,000 species of cacti from all around the world, as well as some delicious frozen margaritas. Tick another of Australia’s big things with a visit to the Big Strawberry, just out of Tocumwal. Whether you want to pick your own strawberries or just come to try their light meals and strawberry deserts, it will definitely be a very sweet visit! 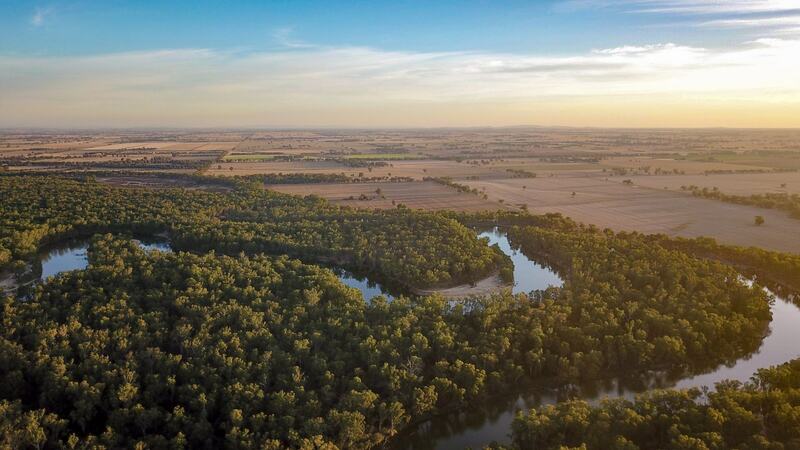 Sun country on the Murray River, Yarrawonga and it’s surrounding towns actually boast more sunny days each year than the Sunshine Coast in Queensland! There’s heaps of free camping to explore here, with lots of different tracks winding down to the Murray River, with lots of river beaches to camp on as well. Check out the epic Lake Mulwala just at the end of the main street of Yarrawonga. The bridge across the river takes you from Victoria to New South Wales (or vice versa) and both sides of the river offer a huge range of water activities to try. 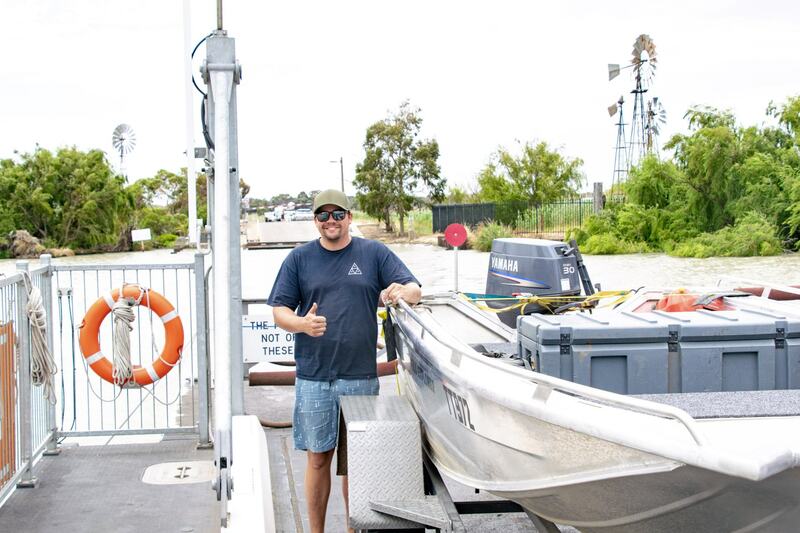 Rent a boat on Lake Mulwala and try your hand at trying to catch a Murray Cod. You can rent boats at either the Yarrawonga Yachy Club or the Mulwala Water Slide. The Yarrawonga/Mulwala website says that you don’t need a boat or fishing licence, but I would double check that if you’re planning to rent one just to be safe! Explore the river on the Chinaman’s Island Walking Track which takes you on a 2km return walk from the Yarrawonga Yacht Club car park. It’s a great way to explore more of the river if you choose to stay in accommodation in town rather than camp at the river. From Yarrawonga, the Murray River winds through Albury Wodonga and Corryong and into the Australian Alps, coming to an end around the base of Mount Kosciuszko. Want to know more about this epic river? Here are some insane facts we found out on our journey along the river. 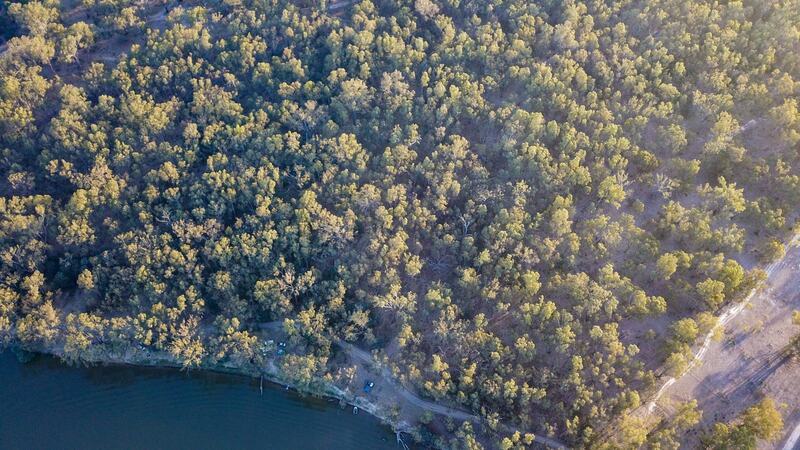 The Murray River is a wonderful place to visit for the ultimate camping holiday. The perfect place to get back to nature and disconnect from technology and the outside world. Whether you’re staying for a night or a week you will have a wonderful time. 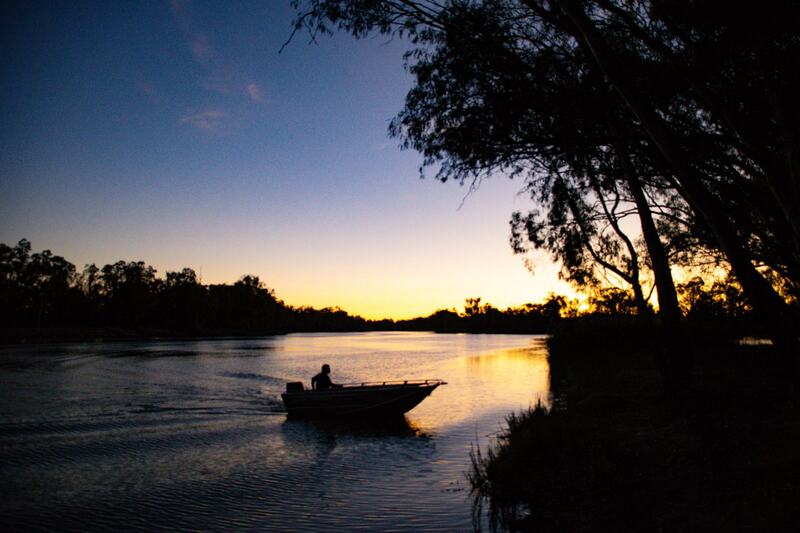 Where’s your favourite place on the Murray River?